SSC EXAM MARCH -2018 NA FORM ONLINE FORM SUBMIT KARVA BABAT NOTIFICATION AND WEBSITE. GSEB is the education board of India founded in 1960 with the aim of conducting board examination. The board will release the official notification regarding the datasheet prior two months of the examination and commencement of the examination will be done in the month of March/April. Time table act as the study plan for the students to score good marks in the examination so we are updating the time table schedule which is anticipated in nature. GSEB is the board which organize and conducts the board examination of standard 10th in the month of March. The notification regarding the upcoming session 2018-19 has not released by the board till yet, but we are updating you the tentative time table which will lead the students to prepare well accordingly. 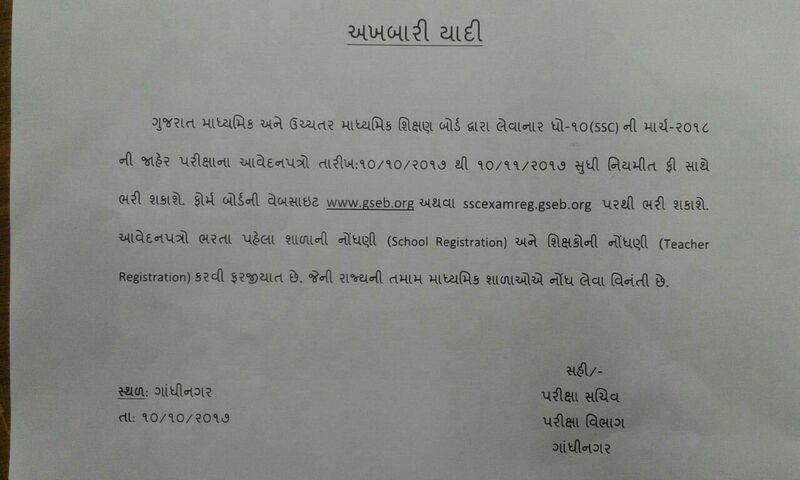 ONLINE REGISTRATION / READ PRESS NOTE.